It's been more than a month after my ultra and I've said it my earlier post 'the stories' that this will be my first and last ultramarathon. But after a week coming back to Brunei, I've decided that next year I will do it again. The pain is temporary but the experience is long lasting. The attention that you get after completing the run is 'WoW'. The comments and compliments that I get from my blog, it's soooo 'WOW' again. 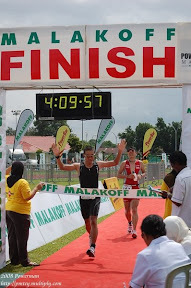 I hoped next year there will be more than one runner from Brunei and hopefully I can improve my time. For now... I just keep on sweating!!! !